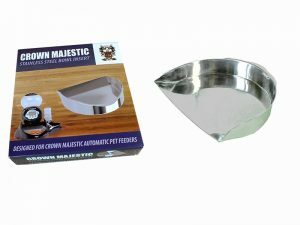 We have gone to great efforts to ensure that our pet feeder is constructed using only non-poisonous ABS and environmentally safe materials; especially the inclusion of a stainless steel bowl insert, for hygienic purposes. The insert weighs 1lb and will not bend or fold. It is easily removed for cleaning.